Former President Goodluck Jonathan has failed to win the prestigious $5 million Mo Ibrahim Prize for Achievement in African Leadership despite meeting a key criterion. The announcement was made on Thursday that no former African leader met the requirements for the 2015 version of the yearly award following a meeting of the independent Prize Committee chaired by Dr. Salim Ahmed Salim. The prize, largest annually awarded prize in the world, which was instituted in 2006 by Sudanese telecoms entrepreneur, Mo Ibrahim, rewards former African leaders who demonstrated sterling qualities while in office, served their constitutionally mandated term; and demonstrated exceptional leadership. “The Prize recognises and celebrates African executive leaders who, under challenging circumstances, have developed their countries and strengthened democracy and human rights for the shared benefit of their people, paving the way for sustainable and equitable prosperity.” It said. The award is also “a standard for excellence in leadership in Africa, and not a ‘first prize’, there is not necessarily a Laureate every year,” the foundation said. A winner enjoys $5m over 10 years and another $200,000 yearly for life and can also ask for another $200,000 for good causes he or she supports. So far, only the former presidents of Mozambique, Joaquim Chissano; Botswana’s Festus Mogae; Namibia’s Hifikepunye Pohamba; and Pedro Piers of Cape Verde have clinched the award. Ex-South African President Nelson Mandela was awarded an honorary prize in 2007. 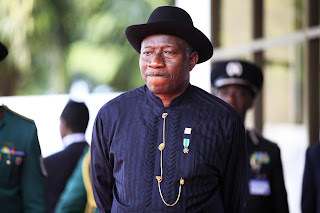 Although, Jonathan seems to have met the Prize criteria which includes Former African Executive Head of State or Government, left office in the last three years, democratically elected, served his or her constitutionally mandated term, demonstrated exceptional leadership; it is unclear why he wasn’t given. Allegations of massive corruption under his administration presently being investigated and prosecuted by the EFCC may have cost Jonathan the prize.